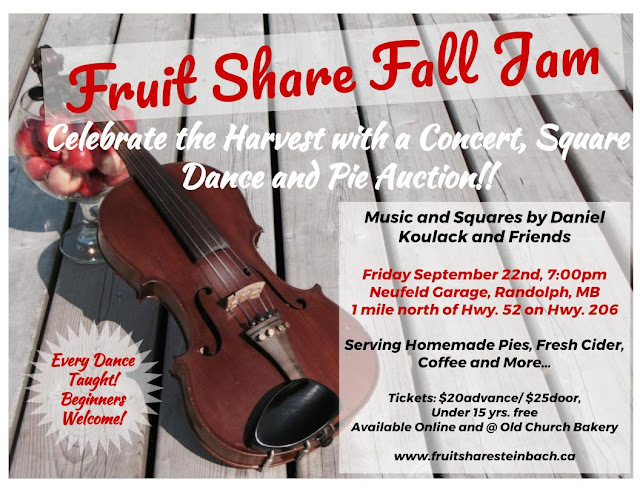 We're having a Concert, Square Dance and Pie Auction! Join us at Neufeld Garage to listen to music, dance, enjoy homemade pies and cider and try your hand at winning a pie in our Pie Auction. Daniel Koulack and some friends are coming to put on a concert for us. It will be an amazing eclectic mix of world music with a little singing and dancing thrown in. Daniel is a wonderfully talented musician who never fails to put on a great show full of energy, laughs and foot-stomping fun. After the concert the band will be putting on a fabulous Square Dance with the charming Daniel Koulack as our Square Dance caller. Bring your dancing shoes! Every Square Dance will be taught! Beginners are welcome! Tickets available online below and in-person at Old Church Bakery. Buy Tickets online here. Your tickets will be waiting for you at the door of the event. Thanks for sharing this article about tickets, I am very appriciated with it. I would like to share the information regarding online Tickets with No Service Charges or Shipping Fees,if you buy theater tickets, live events or concerts tickets, sports tickets, Sonicseats provides you online services without any extra charges.